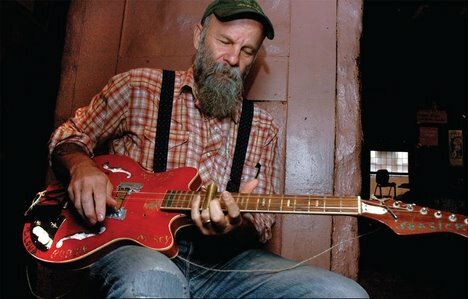 • THE ill skills of bluesman Seasick Steve are showcased on his new album, the fantastic I Started Out With Nothing And I’ve Still Got Most Of It Left. The guitarist’s major label debut and follow-up to breakthough LP Dog House Music sees the Californian, real name Steve Wold, performing alongside Nick Cave and KT Tunstall. • Folk singer songwriter Emily Jane White releases her debut album Dark Undercoat on October 20. The San Franciscan’s first LP. a fragile acoustic collection, is backed up by a European tour during October and November – log on to http://www.emilyjanewhite.com for more information. • Diving into the charts with a new single are The Submarines. You Me And Bourgeoisie is a blend of indie guitar and electronic beats taken from forthcoming album Honeysuckle Weeks. • Welsh one-man wonder Rod Thomas has released a new single, Same Old Lines. The lo-fi folk-pop singer’s new song is a ukelele-led anthem of a track. • Fledgling star Sam Isaac’s new single, Sticker Star And Tape is out now. The single from the singer, who was asked to play the BBC Electric Proms whilst still unsigned, is the first taster from 2009 album Bears. • Get Well Soon are in rude health, having announced a series of headline shows inclusing a visit to Nottingham’s Bodega. The group is the musical vision of Berlin-based Konstantin Gropper, and has been described as “a medieval Radiohead”. • Londoners Me My Head have released their debut single, Damage Is Done. The track is a powerful, short-lived slice of paranoid, agitated new wave. • Castle Donington four-piece Late Of The Pier’s new single, the bass-heavy dance smash Bathroom Gurgle, is unleashed on the record-buying public on October 27. • THE big news in the pop world is the release of Little Jackie’s album The Stoop. The album, the debut from the duo of singer-singwriter Imani Coppola and multi-instrumentalist Adam Pallin, is a genre-mashing mix of pop, hip hop and R&B, and features the hit single The World Should Revolve Around Me. • Florida’s finest Underoath’s sixth studio album has bludgeoned its way into stores this month. The Christian metalcore band’s album, Lost In The Sound Of Separation, is the group’s heaviest effort yet. The group will also be playing dates across the UK including Birmingham’s Academy 2 throughout September. • Comeback kings The Verve have released a new chart-topping album. Forth, the Wigan band’s first release in over a decade, features current hit single Love Is Noise. • Musical royalty Queen and Paul Rodgers release a new single C-Lebrity on September 8. The track, a comment on today’s celebrity-driven culture, is the first track from forthcoming Septmber 15 album The Cosmos Rocks. The supergroup are also touring in the coming months, including trips to Nottingham Arena, Sheffield Arena and Birmingham NIA. • Singalong single Same Old Lines is set to be released by Rod Thomas on September 29. The Welsh singer-songwriter’s live favourite is also sure to feature on the Rod Thomas & It hugs Back tour, which sees the rising star visiting venues including Nottingham’s Lee Rosie’s Tea Shop and Leicester’s The Lounge. • Despite it’s low-key release, Alex Cornish’s debut album Until The Traffic Stops has had some high-profile champions in the likes of Radio 2’s Dermot O’Leary and BBC 6music’s Tom Robinson. And the album’s title track is set for a release on September 29. so you can see what all the fuss about the Edinburgh native is for yourself. • A big noise in indie are up-and-coming Oxford group A Silent Film. The grandiose quartet are set to release their eagerly-awaited debut The City That Sleeps on October 6. This is also preceded by anthemic single Thirteen Times The Strength on September 22 and a tour taking in Nottingham and Birmingham. • Underground rockers The Subways have released a new single, I Won’t Let You Down, taken from the band’s second album All Or Nothing.